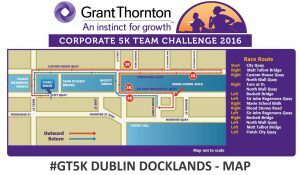 The Grant Thornton 5K Team Challenge will take place tonight (13th September). To facilitate the race, Samuel Beckett Bridge, North Wall Quay and Guild St will be closed to vehicular traffic from 7pm to 8:30pm. As a result, we will be able to pick up at Pearse Street and Eden Quay ONLY during these times and services will divert via Amiens Street and Sheriff Street before proceeding through the tunnel. If you normally board the bus around the 3Arena, we advise proceeding to the Eastern end of Sheriff Street to flag down the 19.00hrs Fingal Express service as we will be unable to access our normal stops during these times.